Google has shut down it China operation……. Google.com.hk tells users, “Welcome to the new home of Google Search in China.” Users can search the Web, the Chinese-language Web, the Web in simplified Chinese and Web sites from China. 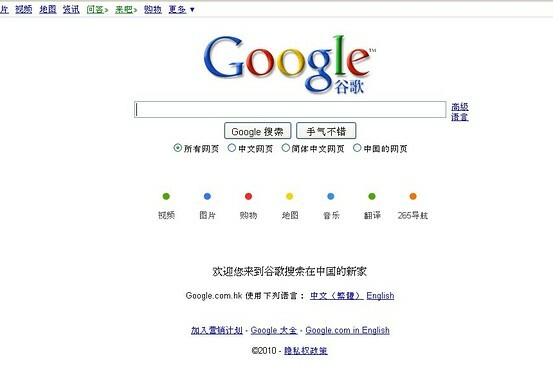 Colored dots point to videos, photos, shopping, maps, music, Google translate and a Chinese-language site called 265. The Chinese have not backed away from it position that any web hosted site in China will abide by its policy of censorship…..
And voted against the policy with their foot…..by closing its Chinese operation and asking users to switch to its Hong kong Based search engines ……. Very few other companies could …..or would make the economic decission…..
Just over two months after threatening to leave Chinabecause of censorship and intrusions from hackers, Google on Monday closed its Internet search service there and began directing users in that country to its uncensored search engine in Hong Kong. While the decision to route mainland Chinese users to Hong Kong is an attempt by Google to skirt censorship requirements without running afoul of Chinese laws, it appears to have angered officials in China, setting the stage for a possible escalation of the conflict, which may include blocking the Hong Kong search service in mainland China. “Google has violated its written promise it made when entering the Chinese market by stopping filtering its searching service and blaming China in insinuation for alleged hacker attacks,” the official said. Google declined to comment on its talks with Chinese authorities, but said that it was under the impression that its move would be seen as a viable compromise. Google’s retreat from China, for now, is only partial. In a blog post, Google said it would retain much of its existing operations in China, including its research and development team and its local sales force. While the China search engine, google.cn, has stopped working, Google will continue to operate online maps and music services in China. Google’s move represents a powerful rejection of Beijing’s censorship but also a risky ploy in which Google, a global technology powerhouse, will essentially turn its back on the world’s largest Internet market, with nearly 400 million Web users. Republican's should take pause with their actions and anger……. They where content with one thing…..That the country would be offering healthcare to more of its citizens….. They where happy to see that the government wasn’t going to pay for abortions…..they where unhappy about the possibility of maybe a tax increase based on the GOP talk….but all said they would gladly pay it if it ment more coverage for everybody….. I was frankly very surprised at the last fact…. One of my co-workers looked me dead in the eye and said….’no matter what he does ….they will hate him.’….another mentioned that he should have extra security…. With that in mind I send you here…. Passage of the health care legislation challenges the heart of the Republicans’ strategy this year: To present a unified opposition to big Democratic ideas, in this case expressed in a stream of bristling anger and occasional mischaracterizations of what the bill would do. From a legislative perspective, the Republican strategy did not work, despite months of predictions from Republicans that the bill would fail and that that would cripple Mr. Obama’s presidency. Mr. Obama will sign the bill Tuesday, although with the support of only Democrats. An additional package of amendments to remove some of the more politically problematic provisions is likely to become law within weeks. In political terms, Republicans face strong crosscurrents. Polls suggest that a sizable part of the nation is unenthusiastic about the bill or opposed to it. Conservatives see it as a strike at the heart of their small-government principles, helping to explain why Republicans are optimistic that they will make gains in the midterm elections in November. But at the same time, many provisions of the bill that go into effect this year — like curbs on insurance companies denying coverage for pre-existing conditions, or the expansion of prescription drug coverage for the elderly — are broadly popular with the public. The more contentious ones, including the mandate for the uninsured to obtain coverage, do not take effect for years. And in a week when Democrats are celebrating the passage of a historic piece of legislation, Republicans find themselves again being portrayed as the party of no, associated with being on the losing side of an often acrid debate and failing to offer a persuasive alternative agenda. The continued GOP harping on the negatives of the basic’s of the bill….. is not resounding with a lot of Americans, who have lost their jobs and their coverage…..Some, as I have, now have children who have lost jobs…or one’s that have lost their coverage…..Weither the Republican’s like it or not ….Obama and the Democrats are going to be seen as doing something…….The GOP as not…. Yet there are elements of the bill, particularly in regulating insurers, that could well prove broadly popular, and it could be years before anyone knows whether the legislation will have big effects on health care quality and the nation’s fiscal condition. Indeed, most Americans with insurance are unlikely to see any immediate change in their coverage, and several Republicans warned that the party could pay a price for that. Republican’s should take pause with their actions and anger……. A new Statewide Survey in the Peach State shows former Democratic Governor Roy Barnes (D-GA) has made the Georgia Governor Race a TOSS-UP Race yet again. The Poll now shows similar findings like they had in January when General Election Trail Heads were polled for the first time. Meanwhile in the Senate Race according to the Poll Incumbent Senator Johnny Isakson (R-GA) leads a Generic Democratic Candidate by 19 Points. Barnes runs competitive here AND the GOP hasn’t really begun in earnest. Republicans need to make sure to keep it civil and not provide Barnes with an opening here. Daniel……Arkansas Senate: Senator Blanche Lincoln (D-AR) OPPOSES Health Care Reconciliation Package; Another Opening for Lt. 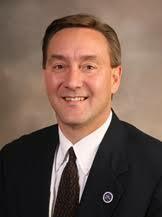 Governor Bill Halter (D-AR)? Arkansas Senator Blanche Lambert Lincoln (D-AR) is the Senator who keeps on giving GIFTS – at least to her Primary Rival, Lieutenant Governor Bill Halter (D-AR). “The Hill” reports Lincoln WILL OPPOSE the Health Care Reconciliation Package in the Senate. Sen. Blanche Lincoln (D-Ark.) will oppose the House reconciliation health bill when her chamber votes on it later this week. The Senate needs 51 votes to pass the reconciliation package. So Lincoln’s vote is not as crucial as it was to pass the Senate health plan, which needed 60 votes. The senator also faces a tough reelection battle and several polls have shown that voters — outraged over the cost of health reform — will not vote for a lawmaker who supported the reform package. This could be yet another Opening for Halter in the Democratic Primary. P. S. We really need a Primary Poll here now. Daniel…..Massachusetts – 10: Announcement; Former MA State Treasurer Joe Malone (R-MA) OFFICIALLY declares his Candidacy for Congress…..
Former Massachusetts State Treasurer Joe Malone (R-MA) made official his bid for retiring U. S. Rep. William “Bill” Delahunt’s (D-MA) House Seat POLITICO reports. 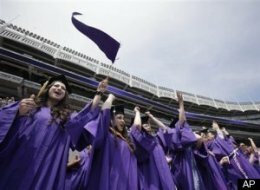 Riding the coattails of a historic health care vote, the House on Sunday also passed a broad reorganization of college aid that affects millions of students and moves President Barack Obama closer to winning yet another of his top domestic policies. The bill rewrites a four-decades-old student loan program, eliminating its reliance on private lenders and uses the savings to direct $36 billion in new spending to Pell Grants for students in financial need. In the biggest piece of education legislation since No Child Left Behind nine years ago, the bill would also provide more than $4 billion to historically black colleges and community colleges. The bill was paired with the expedited health care bill, a marriage of convenience that helped the prospects of each measure. That combined measure passed 220-211. “We are pairing this historic health reform with another opportunity that cannot be missed – the chance to make the single largest investment in college affordability ever at no cost to the taxpayers,” said Rep. George Miller, D-Calif. The Senate will take up the bill next week under the same expedited rules used for health care legislation. That means the Senate can pass the education measure by a simple majority, virtually guaranteeing its success despite qualms from some Democrats and opposition from Republicans. House lawmakers passed the bill last year, but in the Senate it did not have 60 votes to overcome a near certain filibuster. By riding shotgun on the fast-track health care bill, the legislation now can avoid that obstacle. Still, Obama won’t get the Pell Grant expansion he initially sought. Congressional Democrats had to trim their original spending plans when the 10-year savings realized by switching to direct government loans dropped from $87 billion to $61 billion. Private lenders have conducted an all-out lobbying effort against the bill, arguing it would cost thousands of jobs and unnecessarily put the program in the hands of the government. Daniel……North Dakota State Republican Convention: Governor Hoeven and State Senator Rick Berg get GOP Nominations for Senate & Congress…..
North Dakota Republicans held their State Convention this weekend. Unsurprisingly popular Governor John Hoeven (R-ND) got the Republican Nomination for Senate. Barring a Major Scandal Hoeven has the Senate Seat in the bag AND it would surprise me either if he cracks nearly or above 70 % of the Vote in November. 1. A RAS Poll in February had Berg leading Pomeroy 46-40. 2. 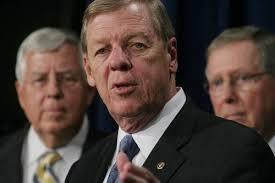 Pomeroy voted YES for the Health Care Reform Bill. 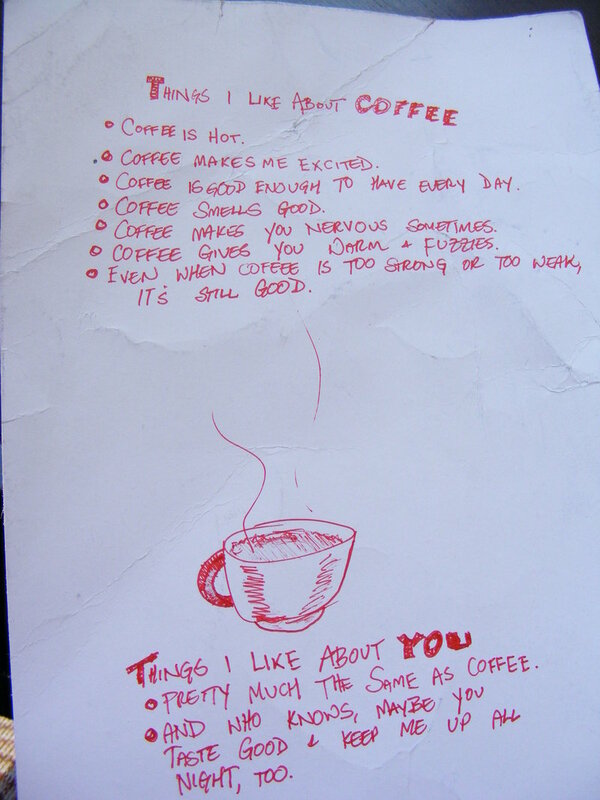 Does he like his Coffee….Black and Sweet? Daniel…..Georgia – 9: U. S. Rep. Nathan Deal (R-GA 9) RESIGNED as he promised…..5 Special House races upcoming…..
It’s ON. We now OFFICIALLY have the 5th Special Election this year as Georgia U. S. Rep. Nathan Deal (R-GA 9) RESIGNED 31 Minutes after the Final Health Care Vote was taken. He promised it though early this month.